On June 28-30, Dan Sai again plays host to one of Thailand’s most bizarre and colorful festivals, the wacky ‘Phi Ta Khon’. Text and Photos by Dave Stamboulis. Northeastern Thailand (Isaan) is mostly off the tourist radar. And, in the tiny village of Dan Sai in the mountainous Loei Province, a town consisting of one main street fronted by a string of nondescript shops, even lost tourists don’t show up. Yet for three days each year Dan Sai plays host to one of Thailand’s most bizarre and colorful festivals, the wacky “Phi Ta Khon.” This year, “Phi Ta Khon” will take place on June 28-30. “Phi Ta Khon” — which translates into either “ghosts with human eyes,” or possibly “ghosts follow villagers” — takes its origins from both Buddhist and animist rituals, of which nobody can ascertain. On the one side, there are connections with the Buddhist “Bun Phra Wet” festival, a religious ceremony in which people congregate to listen to recitations of sermons in hopes of making merit for one’s next rebirth. Yet Dan Sai folks have added the “Bun Bang Fai Rocket Festival” to the program, which is a rain and fertility rite where bamboo rockets are fired into the skies in the hopes the heavens will respond in kind for the coming farming season. Dan Sai’s version features loads of young men and women who, in addition to their colorful spirit costumes, carry wooden phalli and swords, which they use to prod and tease each other as well as bystanders at every opportunity. Throw in some mor lan (Isaan country music), lots of grilled chicken and papaya salad vendors, and more local moonshine and you have the recipe for one funfilled, rump-shaking weekend. 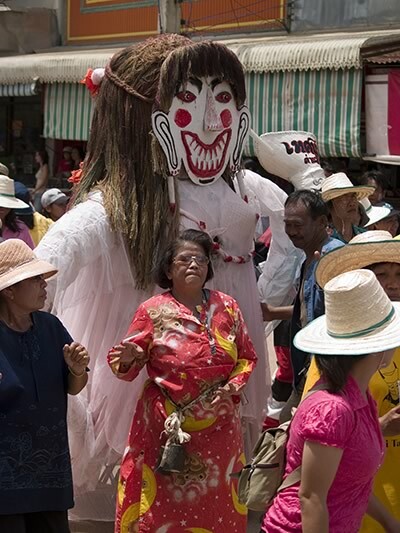 Some say it is the Thai equivalent of Halloween and Mardi Gras. Early on the first morning of the festival, villagers go to the Man Nam River to urge Phra Ubpakhud (a monk with supernatural powers who transformed himself into a white marble and now lives beneath the water) to join in the festivities and bring protection to the community. The villagers collect white pebbles from the riverbed, symbolizing Phra Ubpakhud’s transformation, and bring them to Wat Phon Chai, the town’s main temple, to be blessed. Following this, locals gather at the home of the jao por guan, the village shaman, who sits in a trance state on the floor of his home, surrounded by worshipers. Villagers crawl up to the shaman and tie loops of string around his wrists, and attendants in turn tie strings around the wrists of the devotees. This is known as a bai sii (sacred thread) ceremony, in which the strings are meant to secure khwan, or spirits, who belong to various body parts and functions, and stop them from wandering. Following this, free food and lots of lao khao (rice wine, read: moonshine!) is served, and everyone is ready for some fun. In front of the shaman’s house, several attendants wear giant costumes made up of huge heads and very graphic sexual organs. Known as phi ta khon yai (big Phra Wet spirits), they lead an extremely boisterous parade, which makes its way to the main temple in town. Hundreds of people follow them, dressed in colorful costumes along with masks made from huat (sticky rice containers) that have been painted with elaborate expressions. Beating cowbells, tin cans, and other noisemakers, the merrymakers march through town. Additionally, everyone carries a palad kid (phallus icon), which gets waved, fondled, and prodded into everyone’s face, eliciting laughter, naughty jokes, and lots of flirting from all involved. On the second afternoon, everyone heads for Wat Phon Chai, where the dancing and merrymaking reaches a frenzied crescendo. Soon, the shaman arrives riding atop a float of bamboo rockets borne by dozens of villagers, flanked by monks who are riding on sedan chairs, being tossed into the air by their bearers. At this point, bamboo rockets are fired into the air and the paganism reaches its wild climax. By the end of the celebration, everyone is pretty much sloshed silly, happy as a lark, and feeling like they’ve made enough merit for the year to come. There is also a third day at “Phi Ta Khon” but it is devoted to Buddhist sermons and purifying rituals and is pretty quiet because by this point one massive hangover has fallen over Dan Sai and anyone left in it. The streets get swept, the souvenir and food stalls — which have made a mint — close down, the city folks go home, and Dan Sai returns to its former self, looking much like a ghost town! Getting There: Buses from Morchit Northern Bus Station go to Dan Sai. More conveniently, fly to Phitsanulok or Loei and take the bus to Dan Sai from there. Where to Stay: Phu Pha Nam Resort (www.phuphanamresort.com/) is in the hills outside of Dan Sai. If you want to stay in town, your best bet is the homestay program, where local families put up the excess of visitors for the festival days: Contact Nathum/Namtaeng Home Stay Program at 089-077-2080 or 042-892-339.